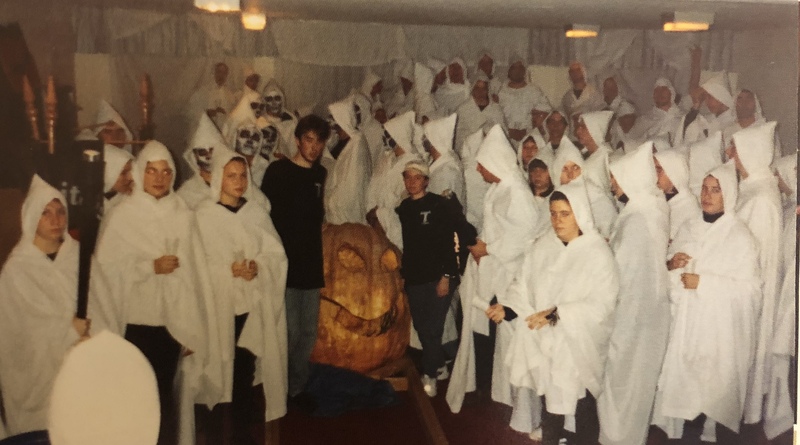 A UNB yearbook photo of the pumpkin sacrifice event. In 1973, a Harrison House student got up on the roof of the building and threw a lit pumpkin down onto the grass. In a literal blaze of fire, the residence’s Halloween tradition was born. The annual pumpkin sacrifice is steeped in over forty years of ritual, much of which is kept secret from non-residents. Each year, students hurl a giant pumpkin – full of sparklers and fireworks – from the roof following an elaborate ceremony that emanates cultish vibes. The event is run by two “loyal guardians,” and traditionally has had a hierarchy including bishops, priests and other positions. For forty-five years, the pumpkin has been sacrificed in a ritual involving chanting, fire and gourd guts. Every year, Harrison House residents howl at the moon for two minutes leading up to quiet hours that precede the event. When the sacrifice occurs on Halloween night, a large pumpkin is carved with a representation of the two-faced Janus, the Roman god of beginnings and endings. 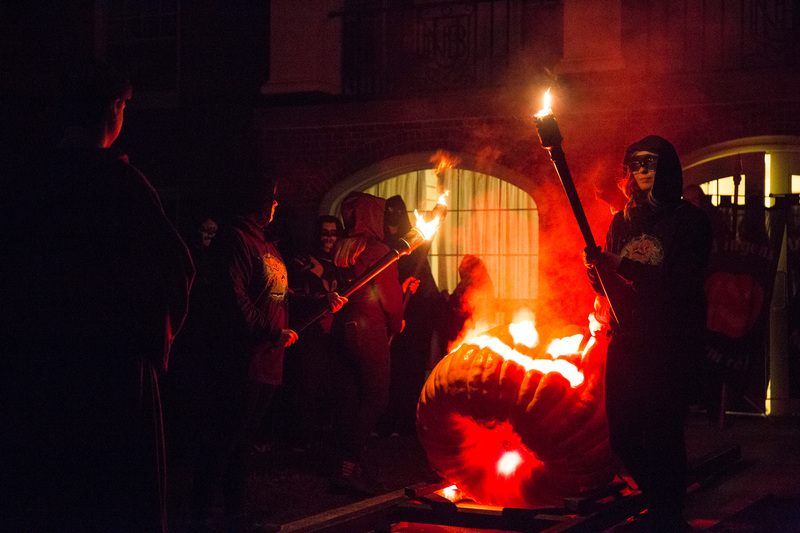 The pumpkin is then taken, by a dark-cloaked processional, out into the courtyard. There the pumpkin is blessed and taken back to the residence to meet its end. “That signifies doing well on your midterms, your assignments, and doing well as the term comes to a close,” she said. 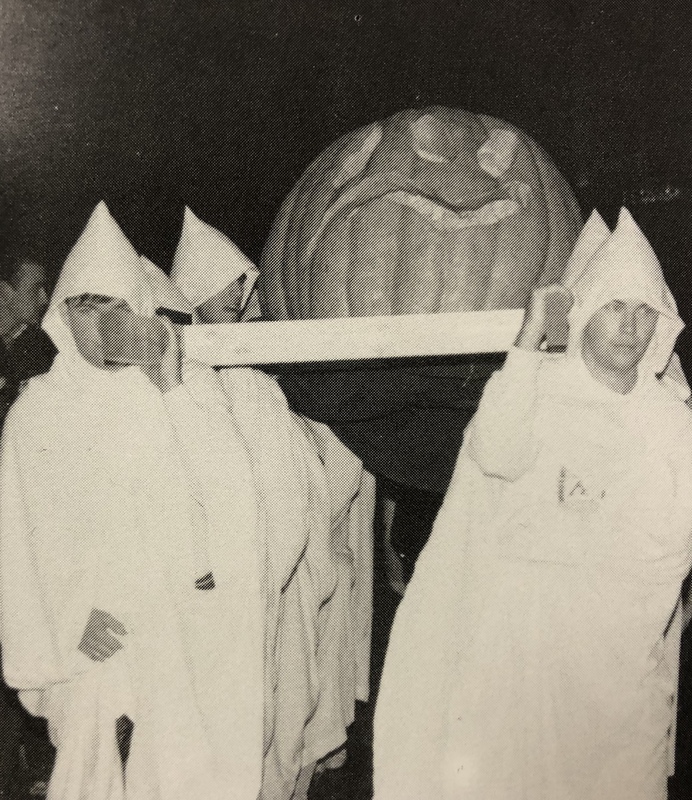 A UNB yearbook photo of the pumpkin sacrifice event shows residents gathering in costume at the start of the ceremony. The pumpkin is sacrificed to the Roman god Janus, who is the god of beginnings and endings, as well as the god of change and time. The distinctive face carved on the Great Pumpkin represents the two-faced nature of the god and the duality of this time in the academic year: the happiness over the end of midterm season, and the sadness and anxiety that accompanies the beginning of final exams. A large pumpkin is carved with a representation of the two-faced Janus, the Roman god of beginnings and endings. 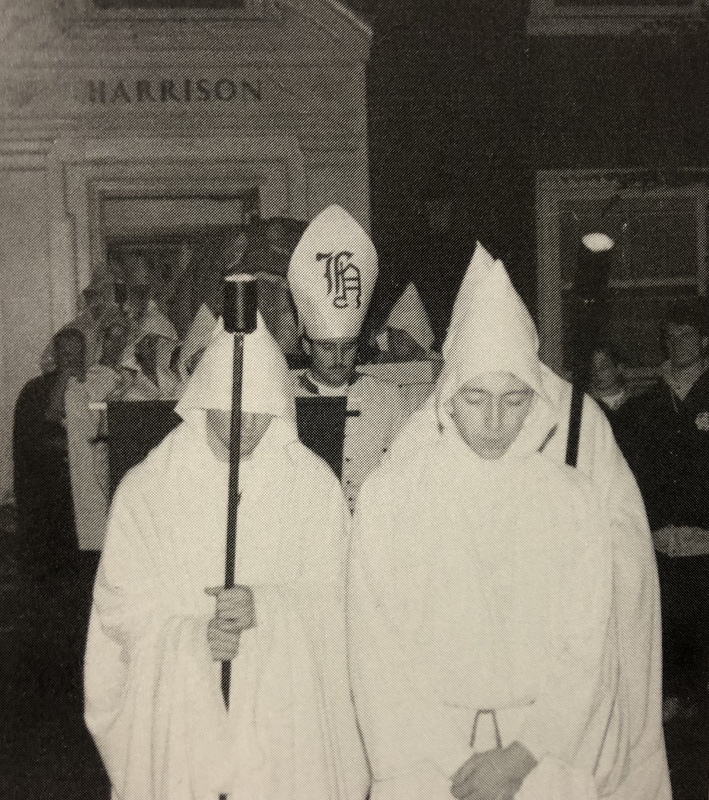 Pictured here is the procession in a UNB yearbook photo of the event. Residents of other houses on campus have historically criticized the event, with some even calling it a form of hazing. Doucet said participation in the event is entirely voluntary, and students sign up to take part. “Most of [the criticism] is just because people don’t understand the tradition, because it’s so mysterious,” she said. Historically the procession wore white, hooded robes, but in recent years the colour has been changed to black. Yearbooks show the attire worn by participants was once highly religious. Pictured here is the procession in a UNB yearbook photo of the event. This year’s sacrifice was reflective of how the tradition has evolved with time. Creepy music played as black robed first year students moved into a blocked off area in front of the windows of the Harrison lounge. Historically the procession wore white, hooded robes, but in recent years the colour has been changed to black. Yearbooks show the attire worn by participants was once highly religious. Every year something new is added to the ritual. This year’s organizers, referred to as “loyal guardians,” brought back an alumnus to do a special poetry reading after the sacrifice, exclusively for Harrison House residents.